Great review Dan. I recently aquired the 0562cf and agree that it is a truly outstanding knife. I’ve owned a few ZT’s and while they were all excellent knives in their own right, this is the first ZT to earn a permanent place in my collection and EDC rotation. All in all this is one fantastic blade. Thank you, Shannon. I agree, the other ZT / Hinderer collabs are nice, but I think they really nailed this one. I am glad to hear you have been enjoying yours too. I own an XM-18 3.5 Slicer “Flipper(lol)” as well and I recommend going with the Zero Tolerance or the Hogue Knives series of flippers.A person could buy 3 ZTs or 4 Hogues for the price of one Hinderer nd get a better knife every time.Yes, Hinderer customs in the $2500-3200 range are built excellent and flip like a Dolphin but the Hinderer mid tech knives that are available to us common folk,ready to part with $750 or so are anemic flippers at best and a discredit to good craftsmanship at worst,IMO. I paid $525 for my XM-18, and while I agree that it doesn’t flip nearly as well as the 0562, I still happen to think that the XM is a nice and substantial knife. If you can snag one at or near MSRP, I think they are “worth it”. I agree that the ZTs and Hogues represent exceptional values, and I would not be able to justify spending $750 or more on a Hinderer when such nice production knives are widely available. Thanks for stopping by and taking the time out to comment. Thanks for the thourough review! I’m excited to receive this knife, especially with all the positive feedback I’ve found online. One YouTube reviewer mentioned that the decorative pivot repeatedly came loose while flipping. He attributed this to the lock-side pivot not being captured by the scale(both sides can turn freely). Have you noticed the need to retighten your pivot after use or the compulsive flipping that we all enjoy? Another reviewer noted that the grinds were uneven on opposite sides of the blade. Any issues with yours? Thanks again for taking the time to bring us these reviews. They are informative and entertaining. I have not had the need to re-tighten my pivot at all, and I’ve been using and flipping the knife for several weeks now. I have not disassembled the knife either, so it may have locktite on it. Very good review! It’s really awesome to see how far you’ve come along man, I remember watching your YouTube videos when you were just getting started! I remember always looking forward to you uploading a new knife review. Its always been fun watching your reviews, and I really appreciate what you’re doing. Crazy how professional you’ve become and how many people have discovered you. Keep up the great work my friend, I really admire your stuff! Thank you, Sbyman – you are making me blush over here! I have always enjoyed working on the website as well as writing and recording the reviews. I am so happy to hear you find them fun and entertaining and am grateful that you have followed along and continue to support my efforts. Thank you again and take care. It’s a pleasure watching your reviews man! Over 2 years ago you did a review of the Benchmade Griptilian and i remember asking your opinion on whether to get the mini or the full size. You told me the full size and I bought it and have always been happy with it! The 0562CF is my first ZT, in fact it’s the only one so far that’s tickled my fancy. And it does it for all the reasons you described and two of those in particular: no stupid cheese-grater jimping (seriously, jimping under the flipper is stupid) and an excellent pocket clip without any silly double-branding (something KAI loves doing). All in all I’ve found it to be a great EDC and ergonomically speaking, it’s right up there with my Para2. Thanks for stopping by, Lew. I am surprised to hear you picked this one up, but am happy you did. It’s a really nice knife. I will be curious to get your take on it after you have been using it for a few months. Enjoy it in good health, my friend. With the rise of high-end production knives such as this, will not “custom” knives have to actually go “custom”? Now we think of “custom” as “hand made” but it actually means bespoke, done to a customers order. I can see paying custom prices for something bespoke, but when I can get this for 250 USD I have a hard time seeing myself paying more for some design of a makers shelf. It’s a good point, Lew. And Tony did a good job explaining in a recent article how the lines and semantics of all of this have changed. I think knives like this raise the bar for everyone. I am not sure if the quality of the 0562 will change the way custom makers take orders. I still think there is plenty of demand for their offerings – where made to a customer’s order or just sold off the shelf. Testify, bro! They ruined the (otherwise very enticing) new Kershaw Camber with the gawdawful huge white “KERSHAW” logo smack in the middle of the handle. Yikes. No sale ’til that disappears or is toned way down. Fire the marketing guy. KAI has really gone in for the big tacky logos lately. Thank you, R.D. Yes I have always found the over the top branding strategy of ZT/KAI to be particularly annoying. And, not to be Mr. Negative here — they DID NOT ruin it on the 0562CF which is truly a beautiful and classy design. Like you said, credit deserved. Word. Thanks for dropping by, R.D. Always a pleasure. Another excellent review. I was able to handle these at G6, and have to agree that this is likely the best ZT/Hinderer collaboration so far. With the quality of knives that some of these companies are putting out, it’s getting harder to justify the cost of customs. I’m looking forward to getting mine, just have to decide on the CF or G10. Thanks, Joseph. If I were to go back and buy one for EDC I’d probably just get the G10 version with the stonewashed blade (hides wear and fingerprints a little better), but you can’t go wrong with either configuration. Thanks for the review Dan. Although I really don’t care for the “hard use” knives, the edge geometry seems promising for most of the work I find myself in contact with. This seems to be the best collaboration between a knife maker yet. Thanks, Joe. I think this edge is pretty aggressive and slicey… at least for a ZT/Hinderer collab. Dan, thankyou for all these great reviews. Would you be willing to breifly compare the 0562 with what seems the be another amazing flipper: the 0801? I will be purchasing one of these for edc. I value premium, refined feel. Something tells me the thin steel liner and g10 on one side of the 0562 will not feel as good in the hand than two meaty slabs of titanium. What do you think? I’m leaning towards the blackwashed 0801. Anybody want to convince me otherwise? The short answer is you can’t go wrong with either knife. Both flip really well and are very well made. I happen to prefer the 0562 over the 801 ergonomically, but both feel good in hand. After seeing the ZT562 in your Rubicon review it sparked my attention to come back here. 🙂 You have done reviews on the 566 and the 562. You compare them both to the 560 and the XM-18 but not to each other. If you were to compare the 560, 566 and 562 all to each other how would you break it down in it’s simplest form? Some folks say the 566 is just a mini-560, if that is true than where does that put the 562? Just curious on your thoughts. I would say the 566 is more like a mini 562 if anything. The 0560 feels more like a different knife with it’s 3-D machining, pocketed frame lock and sharp jimping. The 0562 and 0566 share similar 2-D construction and feel more similar in hand. Very interesting. I didn’t think they would be that different from the 560. I’ll have to try and find one locally that i can hold before i jump on one. To me the 560 is almost perfect. Almost. Zero Tolerance 0562 cf looks awesome. perfect for what I want in a knife. but I cant find it on the zt website. has it been discontinued? I saw a knife that loks very similar on the site though the 0566? it has ELMAX steel for the blad and g10 handle. quad mount clip point up or down cary and is 3.2 inch blade with a 5.3 Oz weight. is only, on the site, listed as $180. is this a replacement for the 0562cf or is it a different knife? if so what do you think of this knife? and a comparison of ELMAX and m390 would be awesome too? thanks Dan nice review only question bout the 0562cf is how well does it stay closed? I saw it fall shut on the video.. will it possibly open in pocket or unintentionally ? also I had another thought. if you had to choose between the 0562 and the Griptilion which would you pick? Sorry, Tyler. I have had a busy weekend here and an inordinately high number of comments on the website lately. It’s a good problem to have, but it also means that it may take me a couple days to respond. It is smaller than the 0562 and is less expensive (G10 handle scales, steel frame lock, assisted opening). It’s a nice knife for the money but I prefer the 0562. The detent on the 0562 is extremely strong and I am not concerned in the slightest about it opening in the pocket. As for the 0562 vs. the Griptilian: they are completely different knives at different price points. For actual use I probably prefer the Griptilian because it is cheaper and for that reason I feel like I can beat on it more. The 0562 is more expensive and is better built with more premium materials, bells and whistles, etc, but the Griptilian remains a no-nonsense utility knife, and an excellent tool in its own right. Hope that helps point you in the right direction. Thanks for reading and for the questions. Hi Dan, im really interested in this knife! Just wondering if you had any problems with blade play on your knife. Thanks a lot! No issues whatsoever. The knife is solid as a rock. Thank you for your knife reviews, I find them very interesting and use them as a reference of sorts. Thank you, Brian! Yes, this is their best effort yet in terms of the Rick Hinderer collaboration. It may also be my favorite ZT to date. Thanks for stopping by and taking the time out to leave the kind comment. I like to flip it a lot, but I have a question and because I’m not an expert, it can be a stupid question, sorry for that. Thanks for dropping by. The steel insert should last the life of the knife. I certainly haven’t worn any of mine out. I don’t think it is necessarily intended to be replaced (although it could in an instance of failure). The idea is, because titanium is relatively soft it will wear out rubbing against the steel tang of the knife. So they added the steel insert. It should be good for a very long time (if not forever). If you do need to replace it for some reason I’d just sent it back to ZT. According to the Amazon info, the steel is not 390 but rather CTS-204P. You should update your review to talk about the new steel (pluses and minuses). Thanks for taking the time to do these reviews. ZT did change the steel mid-way through the initial production of this knife. Both versions can still be found if you look long enough. Thanks, Judas. I updated the review to reflect that ZT is apparently using both steels. I don’t have any direct experience with the 0562CF in 204P, but I wrote what I could! I’ve been using this knife a little and carrying it lately. I’m basicaly going to echo what Dan has said. I bought the G10/Elmax version for $200. Of course, I keep thinking I should have spent the extra $40 for carbon fiber and M390. However, I bought my knife in person (only one they had) and to the eye it was perfect. In one sentence-It is incredible. Fit and finish are excellent. Beautiful 3,5″ blade that has a perfect grind to the naked eye. I love the stone wash on it. The blade centering is dead on. Fairly stiff detent and blade flies out every time. Steel lock bar insert. Over travel stop for lock bar. Awesome deep carry clip. The hardware is very high quality. No cheap, soft screws that strip easy. Not overly done and gaudy. Fairly simple looks but beautiful. Zero Tolerance thought of everything. I’ve handled other ZTs and this is one of the few that has interested me. I have no interest in assisted opening, coated blades, weird blade grinds or overly heavy knives. The 0562 is the perfect balance of a solid knife that still can slice and not weigh down my pocket. It’s not going to slice like a Delica. Although, it does slice well. It’s like comparing the handling of a Porche 911 and a supercharged RangeRover. My brother in law (surgeon) owns both. Two very different animals. Three years ago, I never knew a $200 plus knife existed. I can say that this knife is worth every dime I paid. I don’t know what I would change about it. Maybe, make it a little lighter. And that’s grasping at straws. It only weighs a little over 5ozs and carries very well. 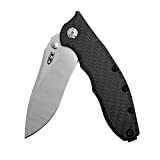 If You buy and enjoy quality knives, the ZT 0562 is a no brainer. I left out a couple things. The ergos are very good. Great in a sabre grip. Good on a reverse grip. I have extra large, meaty hands and it works just fine in any grip. I’ve held a couple more comfortable knives but not by much. I can’t say enough good things about the ZT 0562. Also, I own the Spyderco Sage 1 and Sage 3 (carbon fiber). The build quality of the 0562 is on par with the Taichung Spydercos maybe better IMO. Probably a better value too. But, different knives and the Sage series is excellent. I’m lucky I have an Army/Navy type store 20 minutes from Boston. I can hold and view before buying. The knives are usualy all over priced. However, I wait for them to sit a while and the price will come down. I got the Sage 1 for $138 and the Sage 3 for $135. Not including tax. That being said, my next purchases will be from Amazon through this site. I am currently considering between the two. The more I read the more I am leaning towards CF version. I am considering to sell off my 0566 after getting my hand on this. Dan, what’s your experience of the edge holding, sharpening & does it picks up scratches easily with its satin finished? I would suggest spending the extra coin on the CF version. I think the upgrades are worth the modest jump in price. M390 holds an excellent edge, and it is surprisingly easy to sharpen. I haven’t had issues with scratching, but haven’t used the knife for more than basic EDC tasks. Hope this helps.